I’m kind of a gadget freak. I have bought a number of products because I saw them on infomercials during insomnia bouts at 4am. I am also an As Seen on TV junkie. So I thought maybe it would be helpful to write a blog review about some of these products on occasion. Today I introduce the Spicy Shelf. I saw the commercial for it loved the idea as I have a ton of spices and as you can see in the before picture it was rather messy. I had read reviews a few weeks ago on Amazon for this shelf and they were very mixed. I wasn’t sure so I held off. I didn’t want to waste $20 for junk. I’d done it before and right now our budget is pretty tight. During my research I had seen alternatives to the product as well but kind of “shelved “‘ the entire idea until the other day. After church we were in Rite Aid and I was meandering the aisles as we waited for an RX. There on aisle six with other As Seen on TV items was the Spicy Shelf. It was a sign ( my rationalization for even considering buying it!). I showed it to hubby and he smiled and grabbed it and walked away. I guess we were getting it! So we got it home and I delegated myself to put it together and set it up. I’m the main cook and I like my spices alphabetized (I know- very type A). But before I could put spices on the shelf I had to put it together. It was very trial and error and I can see why the reviews are mixed. I had to make 4 attempts to finally get the fit right. I ended up moving a cabinet shelf up. What I found out was that if you use the short legs to build the shelves a regular spice jar doesn’t fit under it. At one point I has used the smaller legs and the shelf would not sit right bc the door hinge was in the way. So I took it out and made it narrower(the shelves grow and shrink in width). 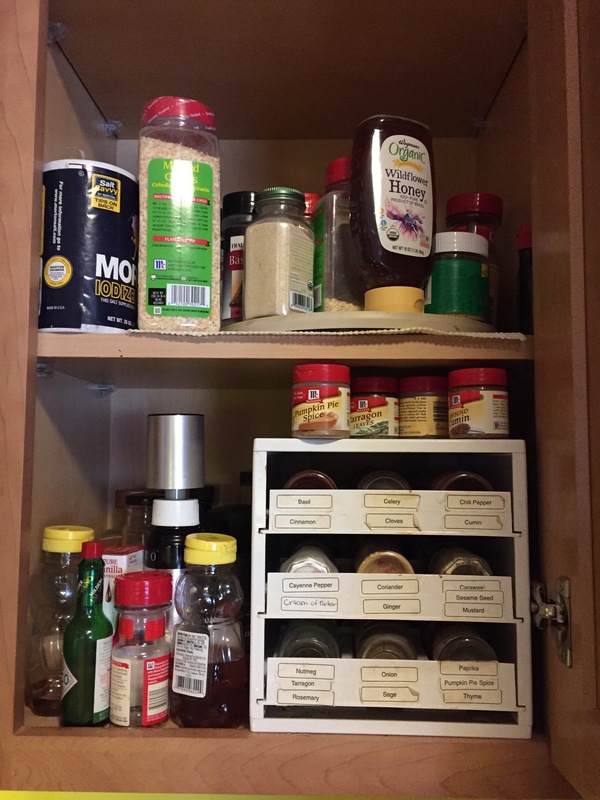 It was after this try that I realized spices weren’t going to fit under the lower shelf – this was frustrating – If you use the shorter legs the regular sized spices won’t fit on the bottom. Not a problem if you use the shorter spices but I have more regular size jars. So my final creation included using the two shelves built using the long legs – this alleviated the issues with it hitting the hinge. 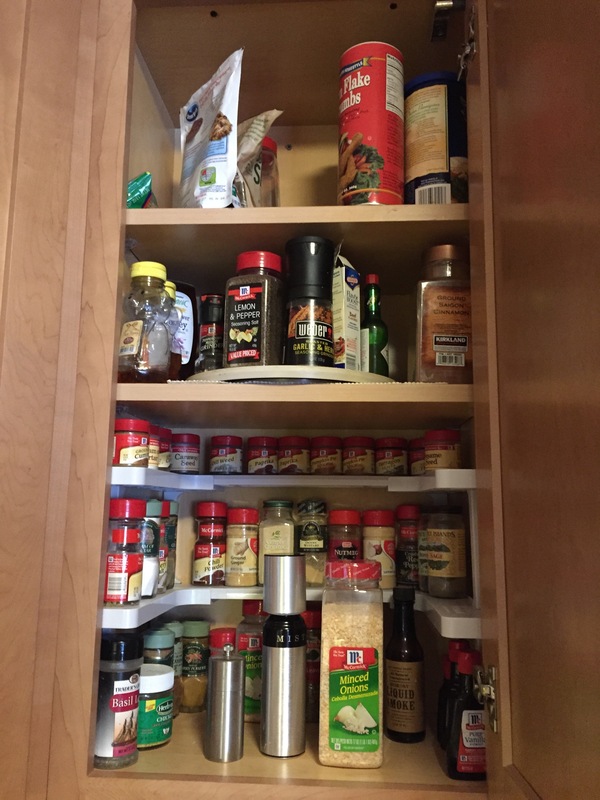 I then moved the cabinet shelf up so the little spices could fit on the top tier of the spicy shelf. There are many configurations and ideas that can be used. The link to their website is below. I should have consulted that first and maybe I would not have had to go four rounds with construction! Here is the finished product. I think it looks awesome! I did read in some reviews that the shelf was rickety and spices fell about as you tried to get them out. I haven’t run across that issue yet. Maybe if the shelves are packed full it can be a problem. I have some room to grow. This reorganization got me to go through all the spices and get rid of old ones and consolidate the multiples..and there were a few! I love purging! I think I might get some more cabinet organizers. I think this shelf might work in the medicine cabinet. But I found another version that might work better for my vitamins. There is nothing better than opening that cabinet and seeing all my spices organized. And yes they are alphabetized… I know…but I like it that way. At this point I would recommend this product. I think it could be a little easier to figure out but it was not hard to take apart and try again. I love the way the cabinet looks and the shelf is functioning just fine. If there are any updates I will post them here. Happy Organizing..
PS- Just ordered another set (plus the bonus) set off their website!